In this article, we’ll show how to create a responsive modern CSS Grid layout, demonstrating how to use fallback code for old browsers, how to add CSS Grid progressively, and how to restructure the layout in small devices and center elements using the alignment properties. In a previous article we explored four different techniques for easily building responsive grid layouts. That article was written back in 2014 — before CSS Grid was available — so in this tutorial, we’ll be using a similar HTML structure but with modern CSS Grid layout. See the Pen css-grid-example4 by SitePoint (@SitePoint) on CodePen. Before we dive into creating our responsive grid demo, let’s first introduce CSS Grid. CSS Grid is a powerful 2-dimensional system that was added to most modern browsers in 2017. It has dramatically changed the way we’re creating HTML layouts. 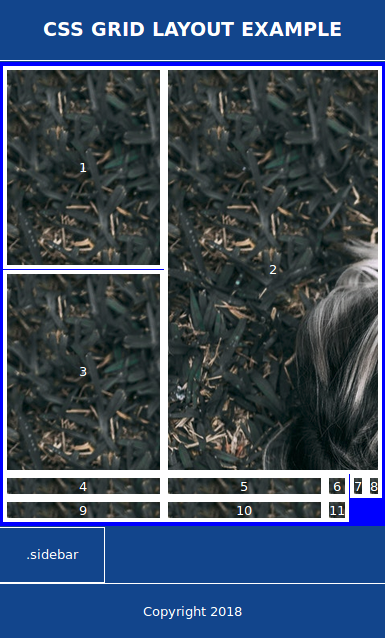 Grid Layout allows us to create grid structures in CSS and not HTML. CSS Grid is supported in most modern browsers except for IE11, which supports an older version of the standard that could give a few issues. You can use caniuse.com to check for support. 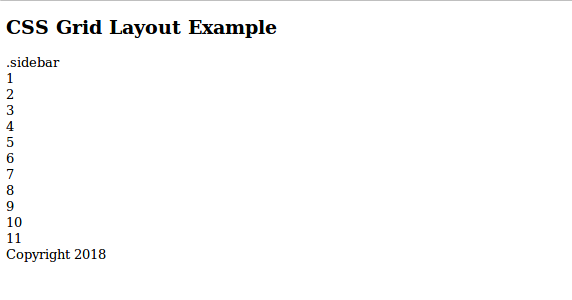 A Grid Layout has a parent container with the display property set to grid or inline-grid. 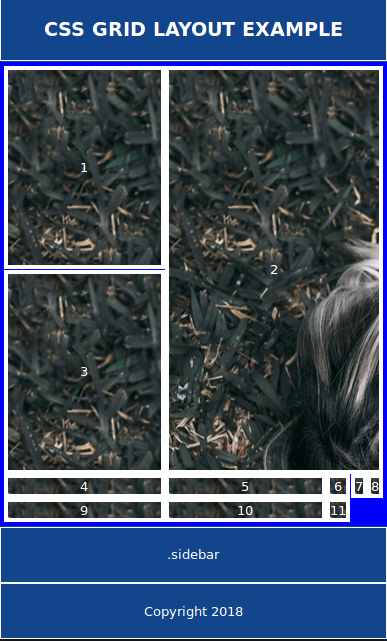 The child elements of the container are grid items which are implicitly positioned thanks to a powerful Grid algorithm. You can also apply different classes to control the placement, dimensions, position and other aspects of the items. We use HTML semantics to define the header, sidebar, main and footer sections of our page. In the main section, we add a set of items using the <article> tag. <article> is an HTML5 semantic tag that could be used for wrapping independent and self-contained content. A single page could have any number of <article> tags. This is a small demonstration page, so we’ll style tags directly to aid readability rather than applying class naming systems. We use floats to position the sidebar to the left and the main section to the right and we set the width of the sidebar to a fixed 6.3rem width. 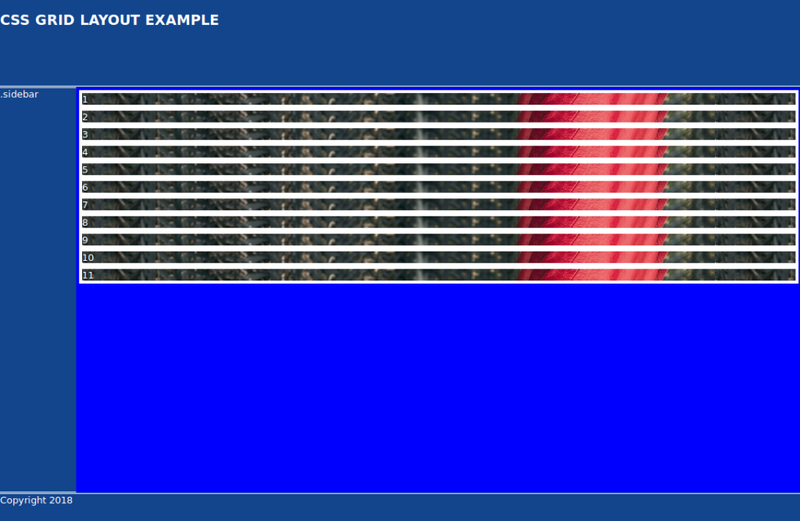 Then we calculate and set the remaining width for the main section using the CSS calc() function. The main section contains a gallery of items organized as vertical blocks. The layout is not perfect. For example, the sidebar does not have the same height as the main content section. There are various CSS techniques to solve the problems but most are hacks or workarounds. Since this layout is a fallback for Grid, it will be seen by a rapidly diminishing number of users. The fallback is usable and good enough. The latest versions of Chrome, Firefox, Edge, Opera and Safari have support for CSS Grid, so that means if your visitors are using these browsers you don’t need to worry about providing a fallback. Also you need to account for evergreen browsers. The latest versions of Chrome, Firefox, Edge, and Safari are evergreen browsers. That is, they automatically update themselves silently without prompting the user. To ensure your layout works in every browser, you can start with a default float-based fallback then use progressive enhancement techniques to apply a modern Grid layout. Those with older browsers will not receive an identical experience but it will be good enough. In a browser that doesn’t support CSS Grid, the grid properties you add will be simply ignored. If you’re using floats for laying out elements, keep in mind that a grid item takes precedence over float. That is, if you add a float: left|right style to an element which is also a grid element (a child of a parent element that has a display: grid style), the float will be ignored in favor of grid. Specific feature support can be checked in CSS using @supports rules. This allows us to override fallback styles where necessary while older browsers ignore the @supports block. We use the display:grid property to mark <body> as a grid container. We set a grid gap of 0.1vw. 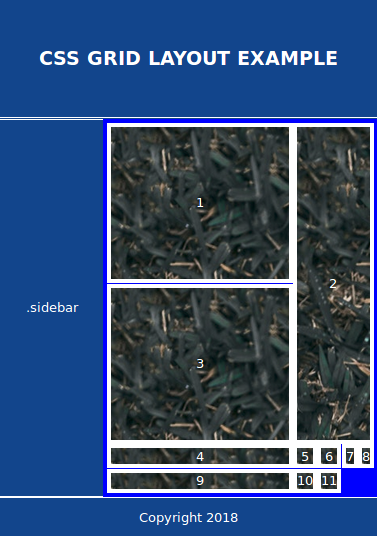 Gaps lets you create gutters between Grid cells instead of using margins. We also use grid-template-columns to add two columns. The first column takes a fixed width which is 6.5rem and the second column takes the remaining width. fr is a fractional unit and 1fr equals one part of the available space. 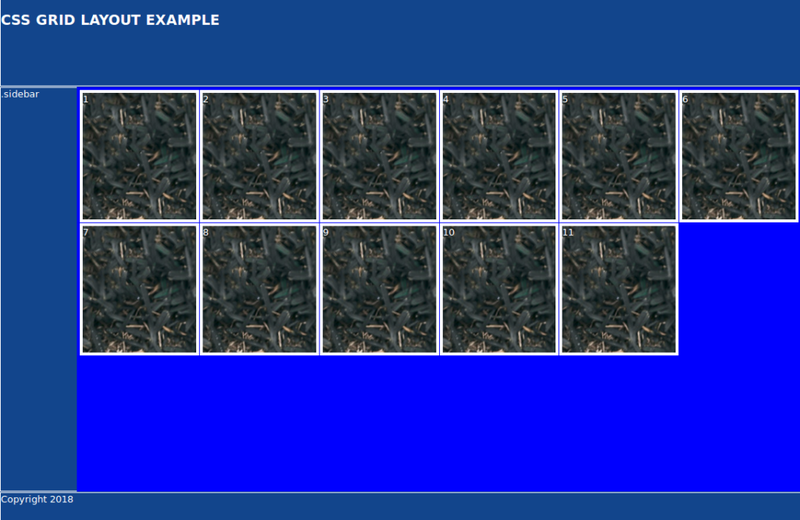 Next, we use grid-template-rows to add three rows. The first row takes a fixed height which equals 6rem, the third row takes a fixed height of 3rem and the remaining available space (1fr) is assigned to the second row. Most of our fallback code doesn’t have any side effects on the CSS Grid except for the width of the main section width: calc(100% - 7.2rem); which calculates the remaining width for the main section after subtracting the width of the sidebar plus any margin/padding spaces. We use a grid gap of 0.1vw and we define columns and rows using the repeat(auto-fill, minmax(12rem, 1fr)); function. The auto-fill option tries to fill the available space with as many columns or rows as possible, creating implicit columns or rows if needed. If you want to fit the available columns or rows into the available space, you need to use auto-fit. Read a good explanation of the differences between auto-fill and auto-fit. grid-column-end: specifies the end position of the grid item within the grid column. You can also use the keyword span to specify how many columns or rows to span. We want to center the text inside the header, sidebar and footer and the numbers inside the <article> elements. CSS Grid provides six properties justify-items, align-items, justify-content, align-content, justify-self and align-self, which can be used to align and justify grid items. 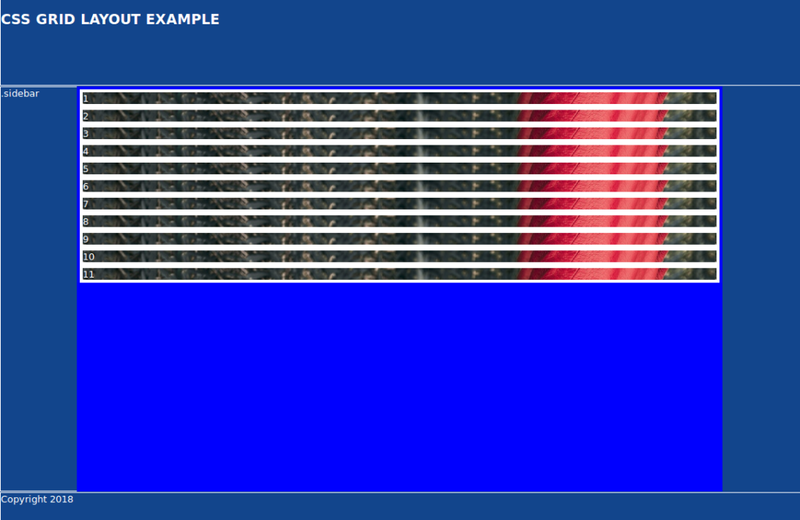 They are actually part of CSS box alignment module. justify-items is used to justify the grid items along the row axis or horizontally. align-items aligns the grid items along the column axis, or vertically. They can both take the start, end, center and stretch values. Our demo layout is convenient for medium and large screens, but might not be the best way to structure the page in small screen devices. Using CSS Grid, we can easily change this layout structure to make it linear in small devices — by redefining Grid areas and using Media Queries. You can find the final code in the pen displayed near the start of this article, or visit the pen directly. 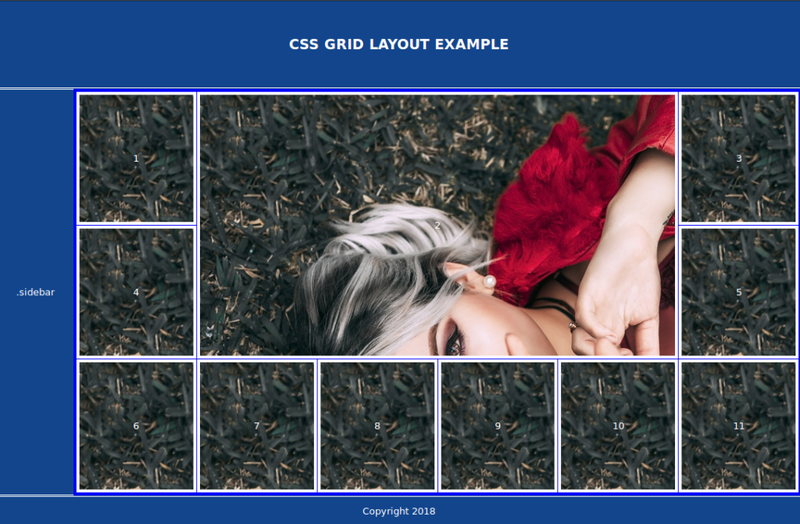 Throughout this tutorial, we’ve created a responsive demo layout with CSS Grid. We’ve demonstrated using fallback code for old browsers, adding CSS Grid progressively, restructuring the layout in small devices and centering elements using the alignment properties.